The basis of Kuk Sool is the development of "Ki"(Internal Power). Therefore Kuk Sool is considered an internal martial arts system. However, it is difficult to classify Kuk Sool under any on name due to its vastness. 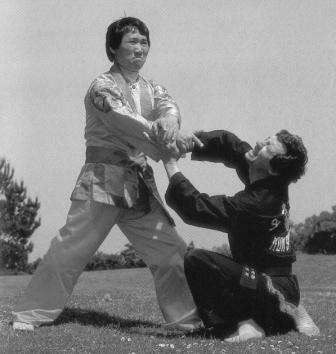 For self-defense, Kuk Sool is unsurpassed. It combines leg techniques, hand strikes, throwing and grappling, falling and acrobatics techniques, choking, joint locking, body conditioning, animal style techniques, and a myriad of weapon techniques into a beautiful and dynamic hard and soft style, emphasizing speed and fluidity. In conjuction with physical training, meditation, breathing, accupressure and acupuncture techniques are emmployed to improve and maintain health, develop internal power and to retard the aging process. Philosophically Kuk Sool stresses humility, self-discipline, loyalty and respect for others. Together, these four aspects of Kuk Sool provide the means for attaining a long and healthier life. Kuk Sool Won™, which can be translated to Korean National Martial art association, is a systematic study of all the traditional fighting arts which together comprise the martial art history of the Korean nation. As such, Kuk Sool Won™ is an extremely well-organized system of martial arts which seeks to integrate and explore all aspects of the traditional Korean Martial arts. As a martial arts system, Kuk Sool Won covers the entire spectrum of the traditional Asian fighting arts and techniqes of body conditioning as well as mental development and traditional weapon training.